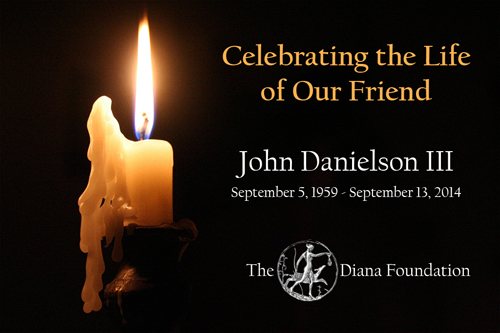 The community is invited to join in a Celebration of the Life of John Danielson III, who passed away September 13, 2014. The Celebration will be held at the Bradshaw Carter Funeral Home, 1734 W. Alabama. Please drop by for an open reception from 2 to 5 pm to share your memories of John with each other and to support his partner Brian Flores. A program of formal remarks, remembrances and music will be presented from 3 to 3:45. As many of you are aware, John supported so many organizations in the city of Houston and in addition touched so many of our lives in the Houston LGBT community. This is our chance to come together to honor his memory. All are welcomed, but due to the expected attendance, please consider carpooling to ease the load on the valet staff. In lieu of flowers, Brian asks that you consider a donation to the newly-created John A Danielson III Memorial Foundation. Details about how to contribute will be provided later this week. John was currently serving his second year as president of The Diana Foundation. It is with great sadness to say good-bye to our leader and friend.